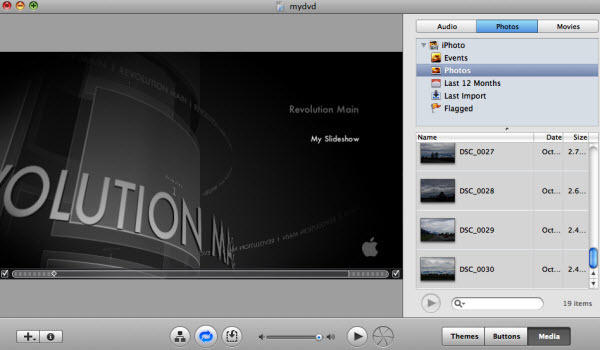 There are lots of Slideshow Makers for Mac OS X users, like iMovie, iDVD, iPhoto and DVD Photo Slideshow. 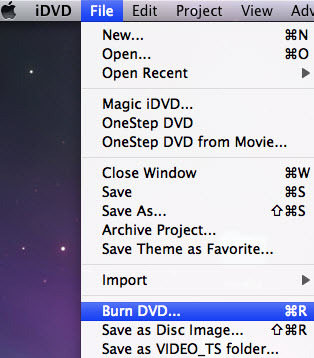 However, if you'd like to burn your slideshow to DVD discs, you may find not all of them have the DVD burning feature. It goes without saying that the Apple iDVD is an excellent Mac Slideshow DVD Burner. Yet, iDVD is no longer available on new Macs that have OS X 10.7 Lion and OS X 10.8 Mountain Lion preinstalled. Obviously, it won't be a built-in Mac app in Mac OS X 10.9 Mavericks either. As a pretty good iDVD alternative, DVD Photo Slideshow can be used to create photo slideshow as well as burn slideshow to DVD with ease. However, the current version of this app does not support video/movie files as the source files. For those who shoot video clips a lot and want to create slideshow DVD discs with them, they have to wait for future versions. In this post, I'd like to show how you can burn slideshow to DVD on Mac for free with iDVD. If you are lucky enough to have iDVD in your Mac, please follow the steps below to make a slideshow of your favorite photos and videos and burn your slideshow to DVD. In the new project, switch to the "Media" tab and then go to "Photos". Then drag and drop photos from iPhoto to the left panel of the project. To import video files, switch to "Movies". After all necessary settings such as background music, themes, buttons, drop zones, click "File" -> "Burn DVD..." to start burning photo slideshows to DVD on Mac. You may also choose to save the project as Disc Image or VIDEO_TS Folder. Note: If you do not have iDVD in your Mac and you only want to burn photos to slideshow DVD, then DVD Photo Slideshow is the best choice.